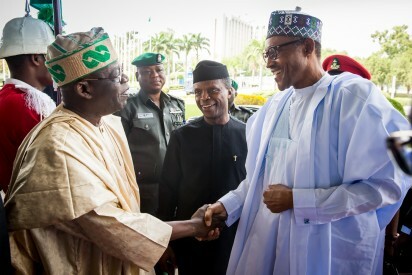 Abuja—FOLLOWING what has been perceived as frosty relations between President Muhammadu Buhari and the National Leader of the All Progressives Congress, APC, Asiwaju Bola Ahmed Tinubu, urgent steps are being taken to reconcile the duo before more damage is done to the well-being of the party. President Buhari, who returned to the country from a three-day official visit to Germany, weekend, immediately went into a meeting with close associates of the former Lagos State governor, in the Presidential Villa, Abuja. At the meeting, said to be the first, after President Buhari’s return, were former Interim National Chairman of the APC, Chief Bisi Akande; Osun State Governor, Rauf Aregbesola and Senator Sola Adeyeye from Osun Central, who are Tinubu’s very close associates. President Buhari being received by Chief Bola Ahmed Tinubu. (File photo) Details of the meeting were sketchy, last night, but sources said the meeting may have deliberated on the alleged strained relationship between Buhari and Tinubu. Also said to have been discussed were internal wrangling within the ruling APC, particularly in Ondo State. A source at the Presidential Villa said the issues discussed must have been crucial since President Buhari convened it moments after he arrived from Germany. The APC has been embroiled in crisis in Ondo State, after the party’s National Chairman, Chief John Odigie-Oyegun, allegedly overruled the party’s National Working Committee’s decision on the party’s governorship primaries and submitted the name of Chief Rotimi Akeredolu as the party’s candidate in the election. Sources said the meeting may have also discussed other pockets of crises in the party. None of those at the meeting could be reached for comments, last night. While he was in Germany, the President’s wife, Aisha, in an interview with BBC, alleged that those who did not campaign for her husband had taken over the government. Mutual associates of the President and Tinubu were yesterday linking the ‘bust-up’ between the first couple to her apparent feeling that Tinubu and a number of those who campaigned for the president’s election had been left out in the scheme of things after the inauguration of the new government. While it could not be confirmed if Aisha’s assertion came up at the meeting, sources told Vanguard, yesterday, that the apparent marginalisation of some of those, who actively campaigned for the APC, may have come up. APC chieftains laud moves to reconcile Buhari and Tinubu Meanwhile, chieftains of the party, yesterday, lauded moves to reconcile President Buhari and Tinubu. Presidential aides, however, claimed to be ignorant of the meeting as of press time, yesterday. A prominent APC chieftain, however, said that the move to reconcile the President and Tinubu had been on for some time. Tinubu’s aides, who confirmed that the meeting took place did not give any indication of what happened. A member of the Board of Trustees, BoT of the APC, Mr Olisaemeka Akamukalem, however, welcomed the intervention of the three men and called for a functional BoT to tackle such conflicts in the future. Spokespersons of Governor Aregbesola, Mr Semiu Okanlawon and Chief Bisi Akande, Mr Lani Baderinwa refused to speak on the issue last night. He said: “I think it is a welcome development that Mr President should wade or is wading into it, but let me reiterate what other people have been saying, that instead of this piecemeal resolution of conflicts, we should have a functional BoT because they would have nipped in the bud this issue which is essentially between some stalwarts and the National Working Committee, NWC. “The crisis is not healthy for the party. The national chairman is our national chairman. Asiwaju (Tinubu) is a respected party leader and I can tell you that without his political sagacity, there would not have been this change, but having been a party leader for over 30 years, I think we should not rubbish the party like this. There should be a way of resolving such issues and this is why the BOT has to be reconstituted and made functional.” Chief Whip of the Senate, Senator Sola Adeyeye, said they were in Aso Rock to see the President on national issues. When asked if the visit was at the instance of the President, he declined to make further comments.